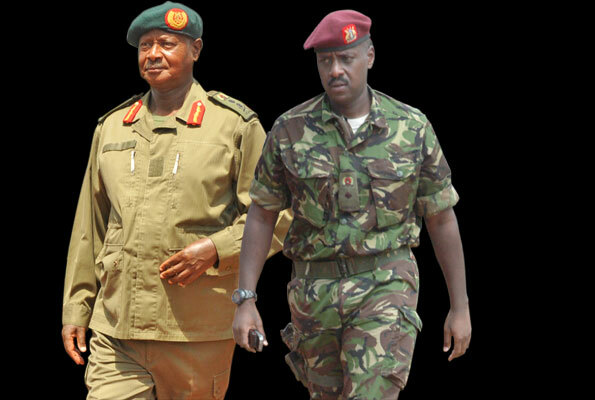 President Yoweri Kaguta Museveni has promoted over 2,000 senior Army officers including his son Muhoozi Kainerugaba the former commander of the Special Forces Command, to the rank of Lieutenant General. Muhoozi is one of the 10 Major Generals promoted to the rank of Lieutenant General in a period of 20 years ever since he began his military career. The 44- year-old Muhoozi has been a Major General since May 16, 2016, after president Museveni promoted him from the rank of Lieutenant Colonel. He was born to Yoweri Kaguta Museveni on 24 of April 1974, in Tanzania and attended Tanzanian and Kenyan schools. But later returned to Uganda after his Father became the President of Uganda in 1986, and attended Kampala Parents School, Kings College Buddo and St Mary’s College Kisubi. After his Secondary School, he joined military in 1994, then University of Nottingham in 1996 and in 1998, he graduated. While in 1999, Muhoozi started his military career with the UPDF in 1999, after he joined Royal Military Academy Sandhurst and in the year 2000, he graduated. He proceeded with his Military training in the Egyptian Military Academy to peruse a course in company and Battalion Command. And after he joined Kalama Armoured Warfare Training School Kabamba, Mubende District. 2007, he attended United States Army Command and General Staff College at Fort Leavenworth, Kansas who later graduate in 2008. Those ranked as Generals include; Lt Gen Joram Mugume, Lt Gen Ivan Koreta, John Mugume, James Nakibus Lakara, Proscovioa Nalweyiso, Peter Elwelu and Pecos Kutesa. Sabiti Muzeyi the Deputy Inspector General of police who was a Brigadier was promoted to the rank of Major General. Felix Kulaigye the former UPDF spokesperson, who has been a Colonel was promoted to Brigadier general while Leopold Kyanda the Army Chief of Staff who has been a Brigadier has been promoted to Major General. Maj Gen Peter Elwelu- Lt Gen.